Charles Spern, a Veggie project engineer with the Engineering Services Contract, relays messages from the Kennedy Space Center Veggie team to assist the crew during the harvest. Six lettuce plants grow aboard the International Space Station as part of the Veg-03 experiment. At the rear of the chamber, a triangle plaque that crew members mounted this summer is visible. The plaque honors the memory and contributions of Thora Halstead and Ken Souza — both giants in the field of Space Biology, and reads: "Dedicated to the memory of space biology pioneers Thora Halstead and Ken Souza, for all they did to plant and nurture the seeds of biological research in space." Halstead conceived of and implemented the NASA Small Payload Program for Life Science through her innovative use of the mid-deck lockers in the space shuttle. She nurtured the program through its early years in the ‘80s and was a founding member of the American Society for Gravitational and Space Research (ASGSR), America’s premier society for space research in the life and physical sciences. Souza was also a founding member of ASGSR, and made numerous contributions to the field of Space Biology during his nearly 50 years with NASA. He was the principal investigator in the first demonstration of successful reproduction of a vertebrate animal (frogs) in space. Souza also had numerous programmatic contributions to the field of Space Biology during his tenure at both Ames Research Center and NASA Headquarters. Both Halstead’s and Souza’s early stewardship of a new science that became the discipline of space biology will continue to benefit future explorers on the journey to Mars. Kimbrough initiated the most recent round of the Veggie experiment on Oct. 25, and for the first time in space, all six lettuce plants are growing simultaneously. 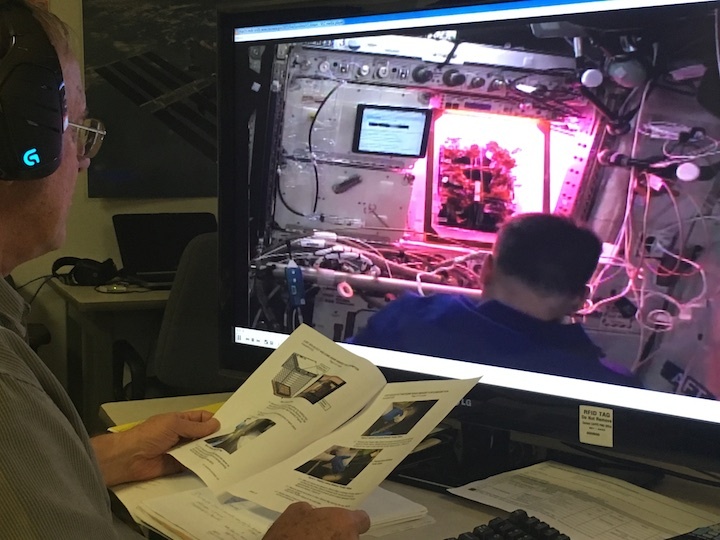 Kimbrough has taken on the part-time role of on-orbit gardener, working virtually autonomously to cultivate the crops, although gardeners on the ground at Kennedy Space Center provided help in the beginning. Cut-and-come-again is a repetitive harvest technique in which a selection of leaves can be harvested for a bit of fresh lettuce and possibly science samples. The remaining leaves and the core of the plant are left intact and will continue to grow and produce more leaves for subsequent harvests approximately every 10 days. The goal is to increase the on-orbit crop yield, as well as allow for more opportunities to supplement astronaut diets with fresh, nutritious food. Today’s harvest will be solely for crew consumption, and the plan is to have four harvests in total, with the final harvest targeted for the first of the new year. The yields from these harvests will be split between samples for science return and crew consumption. 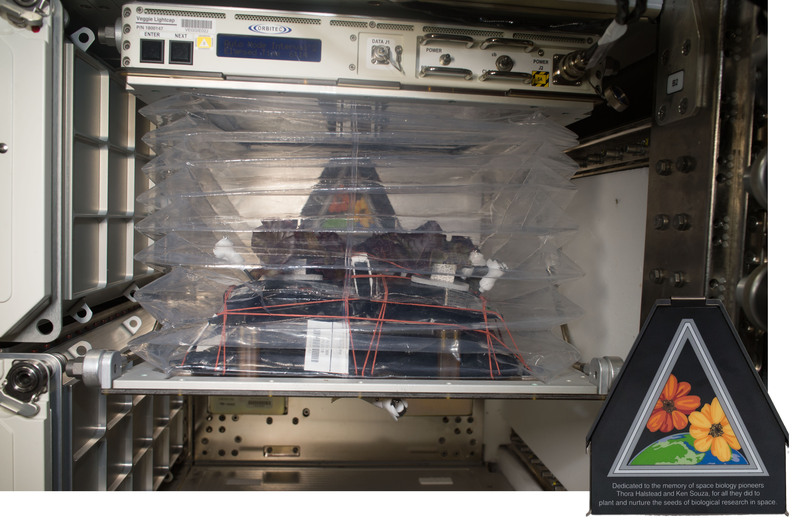 This experiment also is an important demonstration of how NASA applies science across disciplines — in this case Space Biology to grow a healthy crop and Human Research to ensure astronauts remain healthy — to enable human space exploration. NASA’s Space Life and Physical Sciences Research and Applications division integrates and funds such research.